Could the fountain of youth involve something you’re already doing? As you head into your retirement years, you’ll probably understand more than ever the importance of keeping yourself fit and healthy. What if there was one activity that was head and shoulders above everything else for dramatically increasing your life expectancy? For years we’ve been told that walking and swimming are the best exercises for improving our health – and that’s partly true. After all, they’re easy activities to get into, and they’re gentle on the body, especially as you mature. According to recent studies however, the number one pursuit for adding years to your life is the game of tennis! This may not come as a surprise if you already enjoy a match or two a week, whether it’s social or competitive. What may shock you is the number of years it can add! The Mayo Clinic reports that on average, tennis players live more than nine years longer than their non-tennis playing peers. Nine years? That’s astounding. How was the longevity research undertaken? The researchers studied 9,000 people for up to an astonishing 25 years, looking at which physical activity the participants undertook and for how long. They then observed how many of these people developed chronic diseases or died prematurely. They also took into account the participants’ gender, age, education levels, income and whether or not they smoked. The results, published in Mayo Clinic Proceedings, found that not all physical activity is equal when it comes to health and life expectancy. Tennis still came out on top... but they uncovered another vital discovery too. When the results revealed the top three physical activities associated with longevity, there was a common thread. Whilst swimming or jogging can be quite invigorating and enjoyable, there’s usually no social aspect to them. There’s no chatting, no laughs, and no encouraging each other to keep going. You’re on your own! The researchers concluded that it wasn't necessarily the type or duration of physical activity that appeared to cause the longevity boost, but how many people it involved. This social aspect of each sporting activity was deemed a substantial contributing factor to how much longer the participants lived. Many other studies over the years have revealed the importance of having strong social bonds – and that’s especially so once you retire from the workplace. Regular social connection can have a protective effect on your health. So if it’s not necessarily the sport or activity itself, but the environment in which you take part, what are you waiting for? Grab a friend and a couple of tennis racquets and head to the courts to add some years to your life! Try walking or jogging in a group, and remember the gym can be a great place to connect both during and afterwards for some social interaction. Cycling too can be more enjoyable (and safer) when you ride with others. Just because the study has shown that exercising in a group can add years to your life doesn’t mean you have to give up your solo sports. You can still enjoy time on your own if you prefer. Don’t give up that early morning jog if that’s what makes you feel good. Instead of cutting these activities, just consider adding a group element to your regime. Join a running group, find a Saturday morning cycling club, or enrol in group classes in aqua aerobics or even dance. If you’re living in a retirement village there will be plenty of opportunities to socialise while you exercise and if there’s no group doing what you’re interested in, start one! If you can get that life-preserving social connectedness in a variety of sports and activities, you may as well find ones you like. If you’re not naturally ‘sporty’ then pop in for a taste of what’s on offer at your local clubs. Retirement villages offer a range of interesting activities that allow you to try before you commit. Whilst the Mayo Clinic study observes a link between social sports and longer lifespans, it doesn’t prove that if you take a friend along with you, then you’re guaranteed to live longer. You could also argue that healthier people are more likely to undertake social activities, or that other beneficial aspects of these sports may be a contributing factor to the longer life span of participants. Whichever way you look at it, you know that exercising is good for you. You also know that socialising with others and enjoying a laugh together is good for you too. Combining the two has got to be even better for you. Find yourself a ‘play-date’ and give it a go. You have nothing to lose – and maybe years of good health to gain! Discover why Renaissance is a great place to stay active AND social! 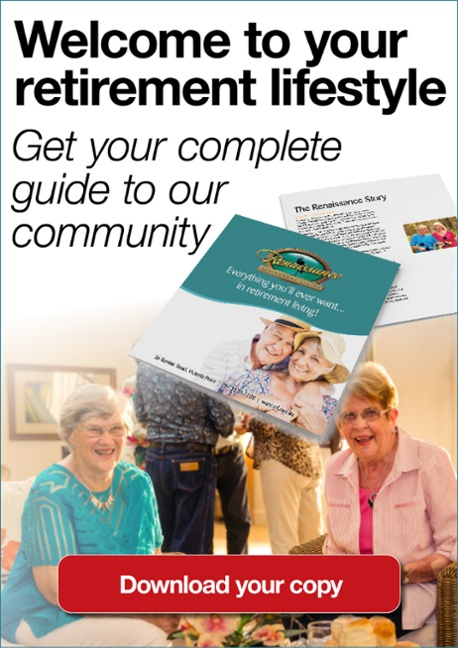 At Renaissance Victoria Point we encourage and support our residents to live happy, independent, and healthy lives. All the facilities you need are right here in your retirement community – with many more close by. You’ll make new friends along the way through our fun and welcoming social scene. It’s the perfect place to continue to take care of your health, vitality and emotional wellbeing. If you’d like to see our facilities for yourself, you’re welcome to come along and tour Renaissance. We’ll be happy to take you around the Leisure Centre and show you what you can enjoy when you live in our modern retirement village. Call Renaissance today on (07) 3820 7700 or get in touch online to find out more about our outstanding Victoria Point retirement living.